If medieval literary studies is, like so many fields, currently conditioned by an ecological turn that dislodges the human from its central place in materialist analysis, then why now focus on the law? Is not the law the most human, if not indeed the human, institution? In proposing that all life in medieval Britain, whether animal or vegetable, was subject to the same legal machine that enabled claims on land, are we not ignoring the ecocritical demand that we counteract human exceptionalism and reframe the past with inhuman eyes? This volume, edited by Randy P. Schiff and Joseph Taylor, responds to these questions by infusing biopolitical material and theory into ecocentric studies of medieval life. 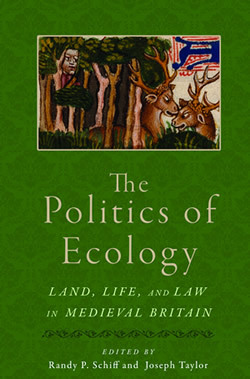 The Politics of Ecology: Land, Life, and Law in Medieval Britain pursues the political power of sovereign law as it disciplines and manages various forms of natural life, and discloses the literary biopolitics played out in texts that work out the fraught interactions of life and law, in all its forms. Contributors to this volume explore such issues as legal networks and death, Arthurian bare life, Chaucerian medical biopolitics, the biopolitics of fur, ecologies of sainthood, arboreal political theology, conservation and political ecology, and geographical melancholy. Bringing together both established and rising critical voices, The Politics of Ecology creates a place for cutting-edge medievalist ecocriticism focused on the intersections of land, life, and law in medieval English, French, and Latin literature. Randy P. Schiff is Associate Professor of English at SUNY Buffalo. Joseph Taylor is Assistant Professor of English at the University of Alabama in Huntsville.